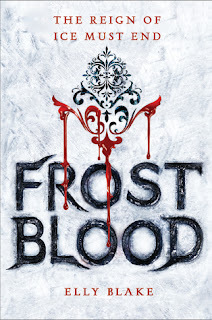 ARC Review: Frostblood by Elly Blake | Read It or Beat It? Today I'm starting a new series on the blog called Read It or Beat It? This series is essentially supposed to guide readers through new and upcoming titles. Are you wondering what 2017 titles should be on your radar? Stay tuned because today I review Frostblood by Elly Blake. In a world of fire and ice, Frostbloods rule as the supreme and dominant power in control. Firebloods, sworn enemies of the Frostbloods, are sought out by the Frostbloods and killed. Some rebel Frostbloods don't believe in the unjust treatment of the King and put their trust into 17-year-old Ruby, who they think is the key to destroying the throne and bringing peace back into the kingdom. Before Ruby can carry out her plan, she is captured and put into the arena where Firebloods are pit against Frostblood champions. Ruby discovers her true power and learns that in order to bring peace to the kingdom, fire and flame would be better off working together than against each other. Battles of the elements, romance, friendship and darkness ensue! For a fantasy book, I expected a lot more. More in terms of world-building, the magic system and even some background/history of the world and characters. I feel like we received very little, and the author depended too much on the readers being familiar with the fire-and-ice type of trope. You know... how fire and ice are like always pitted against each other? I did really enjoy the addition of another aspect into the story. Along with brutal ice king, we see the emergence of another antagonist, one that runs deeper than just physical appearance. We are told that the King has been influenced by the darkness of his power and that somewhere along the way, a young girl will learn how to conquer the darkness and share its power, thus freeing him from his icy throne. I thought the author took quite an interesting direction in her story, as it was well-developed. I really would have liked to see more world-building. I would have liked the author to expand on the world and people outside of certain gifted individuals. We received very little information about the people who didn't have powers in this world. Were they still under the reign of Frostbloods? What power did they have? I also never had a clear image of what this world looked like and how it thrived. With that being said, I think this is very character-driven book. The story is dependent on the main character's- Ruby's -transformation and emergence as a powerful Fireblood. The book also had some great character relationships, not only with the love interest but with Ruby's mentors and her family members. This book was entertaining, fast-paced and was a good set up for this brand new saga. I can definitely see an entire series being made with the set up of the story and characters. However, the story was not as unique as I thought it would be. It's no ground-breaking addition to the shelves of Young Adult fantasy. If we're being honestly, I would have made my rating for this book lower if it wasn't so entertaining and fun to read. If anything, I would vastly compare this book to the Throne of Glass series by Sarah J. Maas. I had heard of this book being compared to Maas' books but, boy, believe me when I say that the books were more than similar! There were just so many parallels to the fan-favorite series, and I disliked how, because of the similarities, I could so easily predict the ending. These days, there's just too many YA fantasy books out there to read. It's nearly impossible to get to all of them. Do I think Frostblood by Elly Blake is a 2017 release that is worth picking up? It depends. I mean, if you're a diehard Throne of Glass fan and like the same old YA tropes then you'll eat this book right up. But if you're looking for a unique spin on the classic YA fantasy genre, I would probably reconsider. Overall, Frostblood by Elly Blake is a quick read that will tug at your inner Throne of Glass fangirl. It was not memorable or ground-breaking, but I feel that readers will enjoy a fun and light read that took a lot of unexpected twists and turns. I'm sorry that there wasn't enough world-building. That can make or break a book for me! Thanks for sharing your thoughts. Is this in a series? I'm so lazy check it on GR right now. If this is in a series, I would totally grab a copy of Frostblood. I am in a need of a fast-paced read right now. Yep! This is supposed to be first in a series called the Frostblood Saga. I really do hope you enjoy it when you end up picking it up! Great review :) This looks like something I'd like, plus the cover's beautiful! I know, the cover is extremely stunning!